Designed by guitarists for guitarists, the Ditto Looper offers five minutes of looping time with 24bit uncompressed audio result. You get unlimited overdubs with optimal tonal integrity and zero latency. The single switch operation allows you to record, playback, overdub, undo/redo, and erase loops. Plus, it produces uncolored tone without any distinctive loss of playback quality. Dimensions (WxDxH): 1.9 x 1.9 3.7"
Get 4 additional Blucoil Celluloid Guitar Picks when you avail this cool bundle today! OFFERS ZERO TONE COLORATION - TC Electronic equipped the Ditto Looper with True Bypass circuitry, which makes sure your low end is clean and tight. You only get the optimum tonal clarity even when the pedal is off. 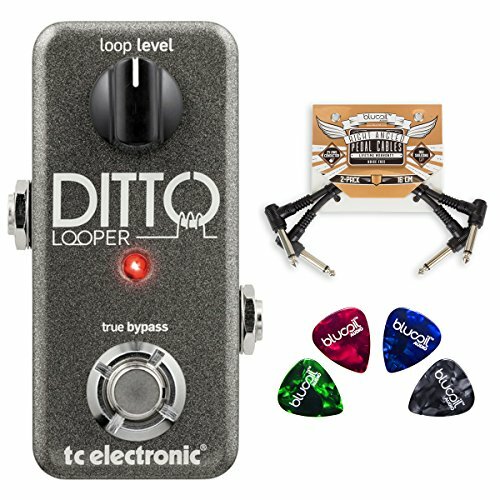 PROVIDES SIMPLE LOOPING SENSE - The TC Electronic Ditto Looper is a highly intuitive pedal that features 5 minutes of looping with unlimited overdubs. ENSURES TONAL INTEGRITY - The pedal's Analog Dry-Through allows unlooped signals to pass through without digital conversion and keeps the original tone pure. INCLUDES - TC Electronic Ditto Looper Effects Pedal. 2-Pack of Blucoil Patch Cables for Effects Pedals. 4-Pack of Blucoil Celluloid Guitar Picks.